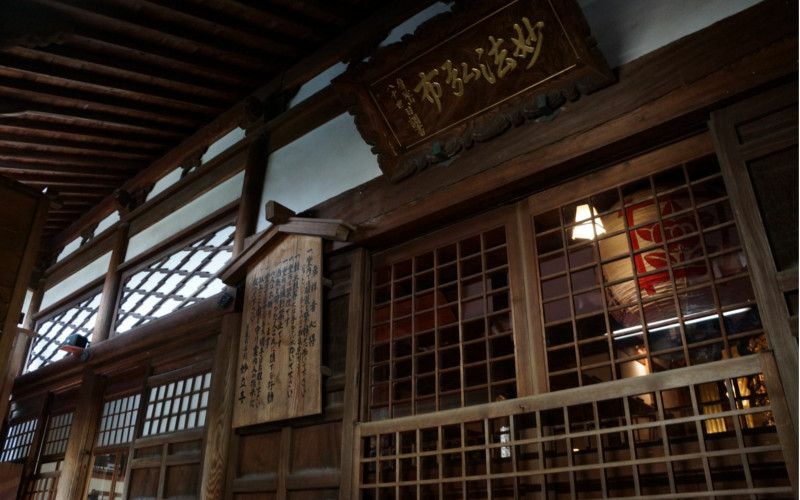 Kanazawa is known as ‘Little Kyoto’ though it’s a magnificent destination in its own right. It’s the capital of the Ishikawa Prefecture and has an impressive number of historical attractions, Buddhist temples, well-presented museums as well as fascinating samurai and geisha districts. 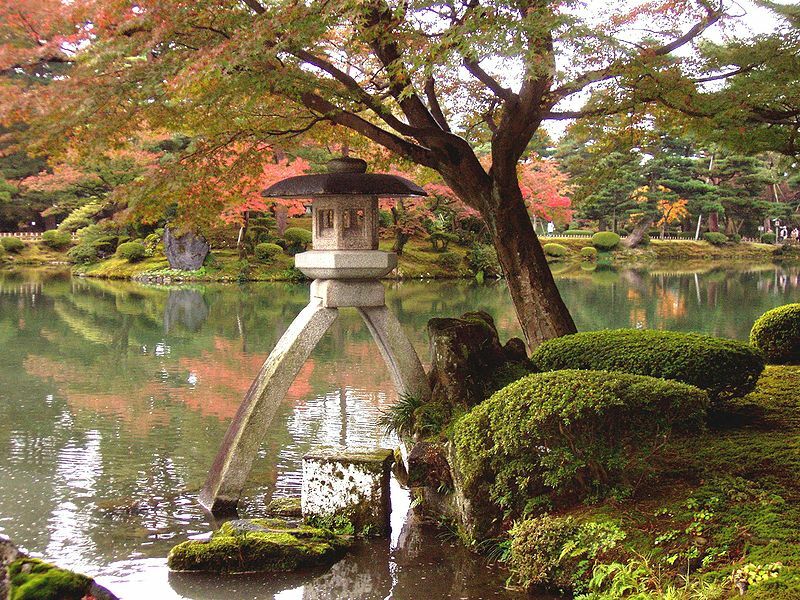 Its best-known attraction is the 17th-century Kenrokuen Castle and its superb garden. 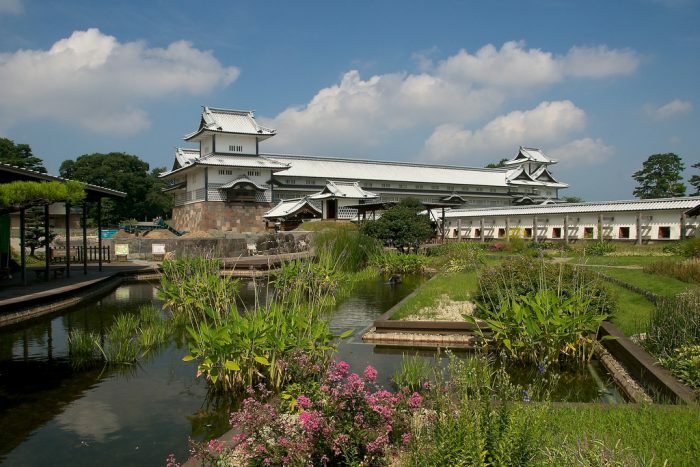 Its one of the country’s very best landscape gardens and it draws visitors from Japan and abroad. The castle was built during the Edo Period (1603-1868) when Kanazawa was home to Japan’s second most powerful clan (the Maeda). During this feudal era, the clan’s rice yield and fief size were enormous. The city boomed as a result to become a political and cultural powerhouse. Unlike many Japanese cities, Kanazawa escaped destruction during World War II. The old town survived and been well-preserved since. The Nagamachi Samurai District and the Higashi Chaya District are particularly charming and are very popular with visitors. Kanazawa is well-connected so it’s easy to get there with your JR Pass. There’s a Tourist Information Center at Kanazawa Station where you can find useful information such as bus timetables and event information. 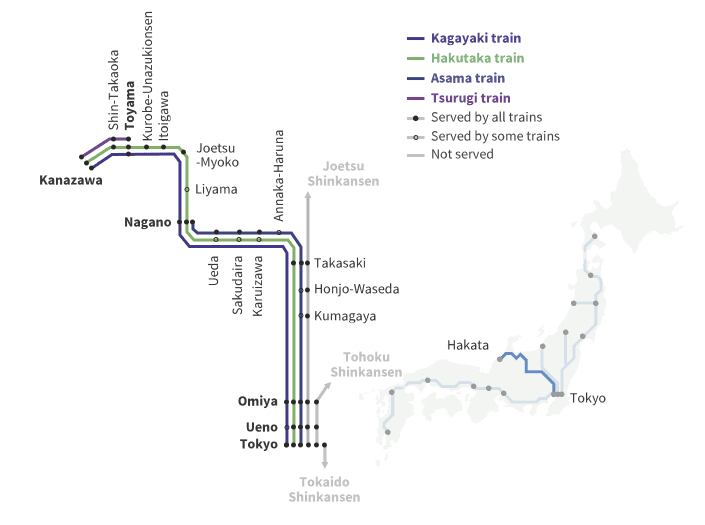 You can travel from Tokyo to Kanazawa directly by bullet train on the JR Hokuriku Shinkansen line. The journey takes between 2.5 and 3 hours. This ride is fully covered with your Japan Rail Pass. The Kagayaki Shinkansen (the fastest service, covering the distance between Tokyo and Kanazawa in 2 hours and 30 minutes, as it makes fewer stops). The cost of a round trip without the JR Pass is around 14.680 yens. The Hakutaka Shinkansen (it makes more stops and the journey takes 3h). A ticket fare without JR Pass on this service is 13,600 yen. The JR Thunderbird limited express trains travel directly and take around an hour. There are connections every hour. Alternatively, you can catch local trains but they take 4-5 hours. There are so many things to see in Kanazawa that it’s impossible to fit it all in over a couple of days. Here’s a handful of the highlights which you must see if you visit Kanazawa. Kenrokuen is the heart of Kanazawa. It’s ranked in the top three gardens in the country and it’s arguably the most beautiful. The gardens are the perfect place to go for a long walk, enjoy the perfect views, and discover the many secrets it has to offer. Kenrokuen means “Garden of the 6 Sublimities“, a reference to a Chinese landscape theory which inspired its design. The gallery showcases art produced since 1980 in a highly-engaging range of mediums including installations, mixed-media, and short films. The circular, well-lit museum has various display spaces and function rooms. It’s very popular but is able to absorb large crowds due to its size. However, at peak season it’s best to go as early as possible. Myōryū-ji is known as the Ninjadera (Ninja temple) as it was as a disguised military outpost which served as a hiding place for the shogun in case of attack. The 4-story building was built in 1643 and contains many defensive features such as hidden stairways, trick doors, secret rooms, and escape routes. A trip to Myōryū-ji captures the imagination of both adults and children. If you’re a fan of Japanese food then you’ll love Omicho Market. There’s an incredible range of locally-caught seafood as well as fresh fruit and vegetables. It’s also a great place to go for a meal as there are plenty of delicious restaurants which use the market’s produce. Daisetsu Teitaro Suzuki is one of the most influential Buddhist philosophers of all time. He wrote numerous books and articles about Buddhism and is credited with introducing Zen and Shin to the West. The spiritual museum is a tribute to his life and accomplishments. The building itself is a stunning complex and visitors can learn and practice some of his teachings by the water mirror garden. 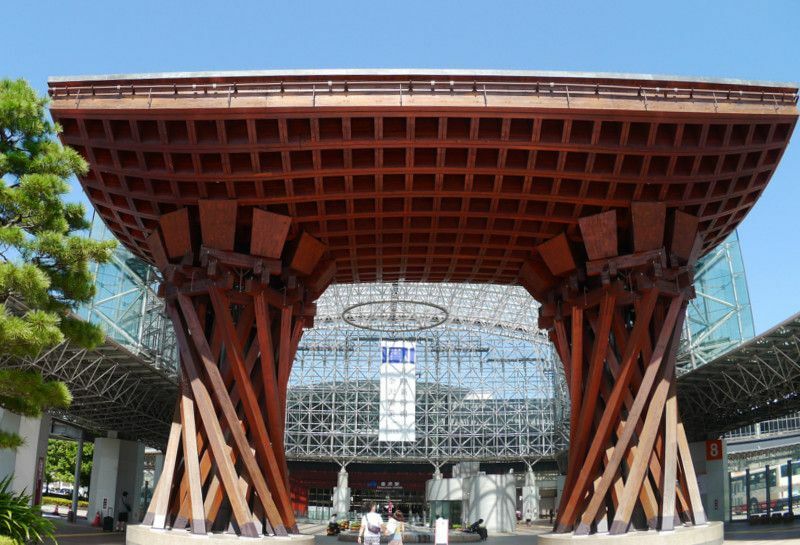 You can visit Kanazawa at any time as it has a temperate climate. However, the best times of year to visit Kanazawa are March to May and September to November. The winter can be cold and damp and summer can be uncomfortably hot and humid so the times in between are ideal. Weather aside, the summer is an exciting time to go as you witness the amazing firework displays and enjoy a host of festivals. 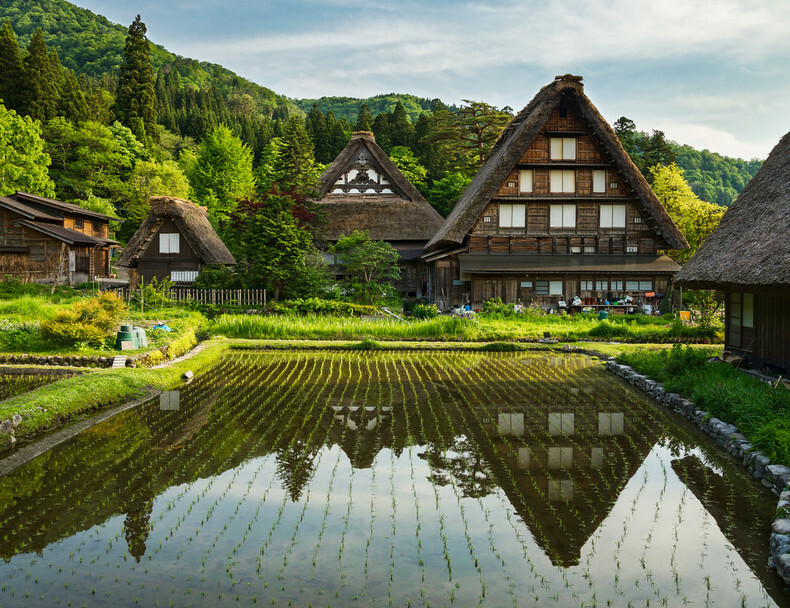 Shirakawa-go is a scenic mountain village with fascinating UNESCO World Heritage Sites. It’s close to Kanazawa so many visitors take advantage of this and travel there from Kanazawa. The Hokutetsu Bus company runs regular highway bus services which take an hour.